In yesterday’s insightful article featuring Beyoncé @ The Lemonade Stand, there is a link to a previous article about the Tidal-Prince partnership, in which he actually left some solid pimpformation for those of us who are cut from a certain cloth to act on. Now from that point, after reading up on the news about Princes’ astronomically valuable music catalog of both released and unreleased music, I conducted a Google search to see what was on the menu and the prices for the valuable content to see what’s really what, and I came across the album and song that is featured in this post, even though I am not quite sure about what actually happened with the full album being released, yet did find it as a bit of a surprise to see this audio file available on YouTube, provided by Warner Bros, while knowing about Prince and his “reluctance” to have any of his material available for consumption online, especially without his say so. 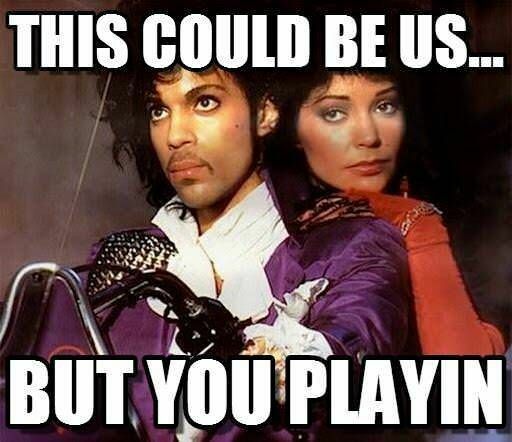 Then I recalled the fact that the popular meme and idea of “This Could Be Us But You Playing” that featured the Purple Rain visual with himself and Appolonia that went viral was something that he actually liked and agreed with, and from the looks of it, he decided to put forth the effort to give the people what they want. Long story short, as a continuation of this mission and as a fellow visionary and solutions provider who on quite a few levels is inspired by the works of Prince, it is a self evident truth that the way to go from how it is, to how it could and should be really begins with having a clear picture of how one would prefer for it to be, along with agreement from individuals who are willing to put forth the collective effort to make it be as such, because truth be told, how ever it is, whether the same or different from how one would like for it to be, came to be from an individual’s and or groups collective idea/mental picture of how they may or may not preferred for it to be, along with the individual and collective effort to manifest the image into what some call reality, and others call perception, and I Rylan Branch and we here at PimpHop.com call a different perspective to consider.